Tasker : To Do List | Task Manager organizes your to-do task in folder and lists in chronological way. Has clean interface and features like adding your contacts, photos etc. 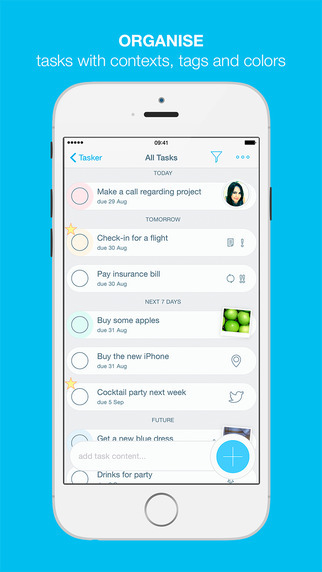 You can even color code your tasks. World has become a place where everybody has to earn for a living. To be in a job or business, you will have hands full of tasks. And these tasks are better reminded with the invention of smartphone. Now you no longer need take notes in paper and keep it safe. 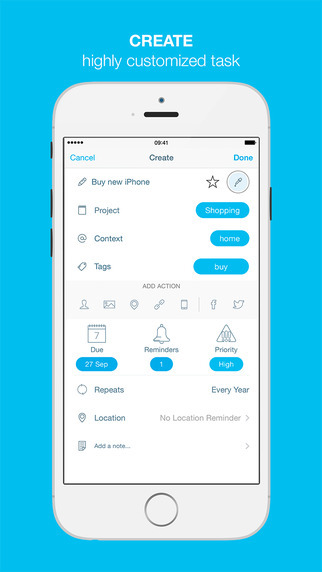 Taking to-do tasks in your phone gives you lost of benefits. And those benefits range from getting reminders about a to-do task, postponing a to-do task to analyzing performance by using completed tasks. 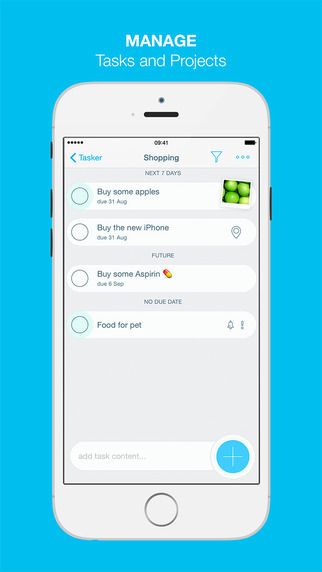 So we need better app for that and Vacata AG brought an app called Tasker : To Do List | Task Manager. Tasker is a task manager to maintain your to-do tasks. Tasker app is available for your iOS devices like iPhone, iPad, and iPod touch. It requires version 8.2 or later of iOS as the Tasker app has features that support Apple Watch. One of the best feature of Tasker app is it can sync your tasks across devices, even without registration. Yes. To use this app you do not need to register yourself to Tasker. Tasker got a clean interface and your tasks will look so cool with its colors and fonts. You can include your contacts, photos, maps, links etc. to the tasks. You can even connect to Facebook and Twitter. All you need to do is create projects, which is like a folder that contains tasks. And as usual a task has to set a due date to get reminded. 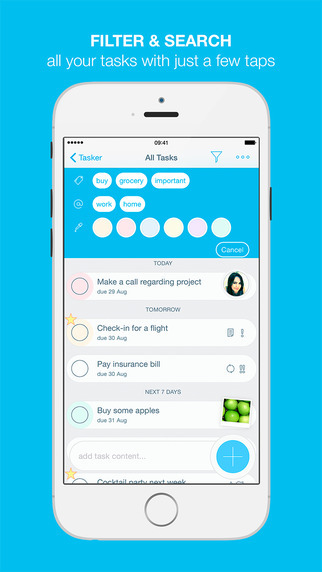 Your tasks can have different colors, so that you know what is the priority of the task. People usually use red color for urgent or unavoidable tasks, while use green color for tasks that can be postponed. You can also make use of tags, which list you tasks of a particular tag. Once you create tasks with due-dates, the tasks are shown chronologically in Tasker. The tasks are grouped like today, tomorrow, next 7 days, future and then tasks with no due date. And Tasker app also has support to Apple Watch, which makes it stand out of the crowd. You no longer need to unlock and open Tasker app to look at tasks. You just need to open Tasker widget in your Apple Watch and see or complete the task. Tasker really puts your tasks at your hand, right? You can also expect the task to be rearranged as you may add new task later, but it will have high priority. So you need to rearrange the task. You can do that just like a breeze. You can also filter your task to find something quick. Tasker will remind you task based on time or location or both. That is some wonderful feature of the app.